Donald Davis is pictured during a jury trial in Highland County Common Pleas Court on Monday. Defense attorney Kathryn Hapner is also pictured. Donald M. Davis, 37, was charged in a March indictment with felonious assault. That charge carries a possible eight years in prison. According to an affidavit filed on the incident, Greenfield police responded in February to a call that a man was holding a knife to the throat of a female. According to the affidavit, at this point the female said a dog in the home “attacked her.” She sustained a dog bite to her leg. The victim also told police that Davis was throwing canned food at her, tried to dump coffee on her, and threw the coffee maker at her. On Monday, jurors heard testimony from the victim and her daughter, the two responding Greenfield police officers, and the defendant. In her closing statement, defense attorney Kathryn Hapner said there was “no doubt” a confrontation took place between Davis and the female victim, but she asked that jurors consider the aspect of the charge involving a deadly weapon. Hapner said Davis didn’t use the knife as a deadly weapon. She said that while Davis testified that he did have a knife, it was to cut himself. And when the victim tried to get the knife away from him is when she received her “minor” injuries. According to the affidavit, the victim had a laceration on a ring finger and was cut on her wrist. Hapner said if Davis meant to harm the victim, he could have stabbed her, but he didn’t. “Did things get out of control? Absolutely,” Hapner said. Highland County Prosecutor Anneka Collins said in her closing statement that Davis “knew what he was doing” when he put the knife to the victim’s throat. “He was going to teach her a lesson,” Collins said, adding that Davis testified that the victim wasn’t going to disrespect him anymore as he threw coffee at her. She said that Davis, who showed jurors during his testimony marks on his arms from cutting himself, wanted the jury to believe that his self-mutilation was the reason he had the knife, but she said that according to the testimony of Sgt. Jeremiah Oyer with the Greenfield Police Department, Davis had no blood on him when they responded to the home. 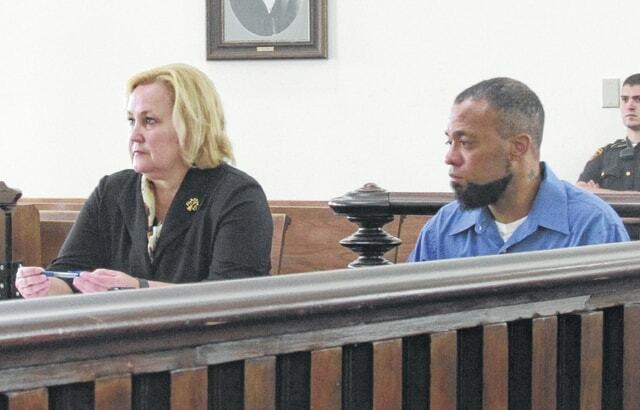 Collins said the severity of the victim’s injuries was not the question for jurors, but whether Davis did “cause or attempt to cause physical harm” to the victim with the knife. And he did, she said. “It cannot be OK to hold a knife to someone’s throat … to cut someone … to brutalize” a mother in front of her child, Collins said. Jurors deliberated for just over an hour before returning a guilty verdict on the lesser, included charge of first-degree misdemeanor assault. Davis has been in jail since his Feb. arrest, and has 111 days credit on the 180-day jail sentence, Coss said. Six months in jail is the maximum sentence on the first-degree misdemeanor.